Approximately 87,000 Undocumented Myanmar Nationals (UMNs) have so far entered Bangladesh following an outbreak of violence on October 9 last year in the Rakhine State of Myanmar. The influx slowed in late February 2017; however, more new arrivals from Myanmar were reported in the month of July, according to an assessment made by the International Organisation for Migration (IOM). Though the assessment showed 80,000 new arrivals, the figure stood over 87,000 with more new arrivals in July and August this year, officials in Cox's Bazaar said. The majority of UMNs are living in Ukhia and Teknaf upazilas of Cox's Bazar district, a district bordering Myanmar identified as the main entry area for border crossing. A total of 57 sites were assessed. 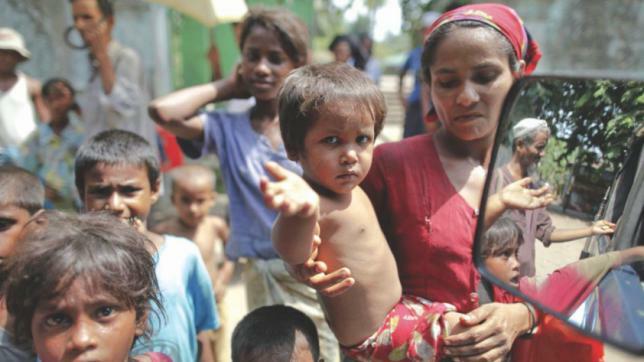 Some 1,64,000 UMNs were identified in two upazilas of Cox's Bazar district. An additional four sites with a population of 635, according to NPM Round 2 (April 2017), were not assessed in this round due to limited access. Among those assessed, 52% are women and girls. Some 87,000 arrived since October 2016, with an increase in both makeshift settlements and host communities, due to newly arrivals of UMNs across the border from Myanmar in the month of July. The National Strategy on Myanmar Refugees and Undocumented Myanmar Nationals (UMN) formulated by the government of Bangladesh highlighted the fact that more than 3,00,000 Rohingyas have crossed the border and are living in Bangladesh. Needs and Population Monitoring (NPM) is designed to regularly and systematically capture, monitor and disseminate information to provide a better understanding of the movements and evolving needs of populations on the move, whether on site or en route. The NPM tools operate at two levels (baseline and site assessments) and capture baseline information, population movement dynamics and community level needs by sector. Currently NPM is only conducted in two upazilas, and the population assessed does not represent the overall Rohingya population.